Tabanan, Bali, 05 February 2014 – Friends of the National Parks Foundation (FNPF) is caring for a group of endangered juvenile gibbons which have just been rescued from wildlife traders. 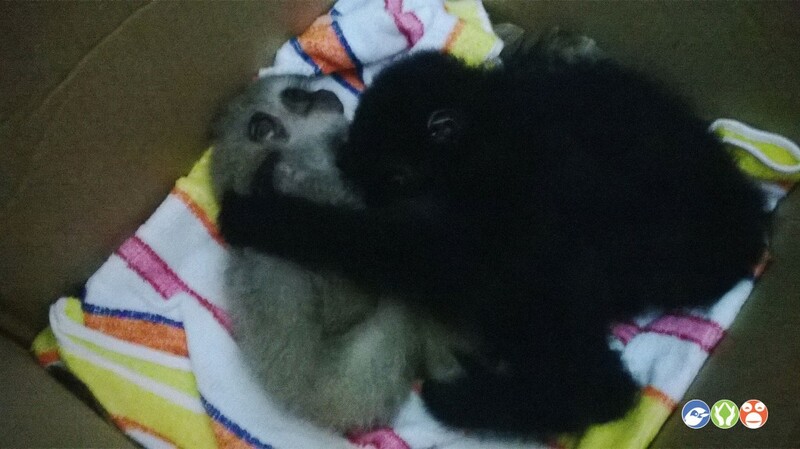 The primates –three Agile gibbons (Hylobates agilis) from Kalimantan and four siamangs (Symphalangus syndactylus) from Sumatra – arrived at our Bali Wildlife Rescue Center in Tabanan on 23 January after being confiscated by forest rangers. One of the baby Agile gibbons has since died – he was very weak and suffered from having been separated from his mother and the hardship of his long journey. The traders had kept the gibbons –believed to be destined for Russia – in boxes and taken them across Indonesia. “All of them are very young – two of them are still so young that they need to be bottle-fed and require attention 24/7,” FNPF’s founder and director, Dr Bayu Wirayudha says. “They have all received health checks, and some of them have received medical treatment. “We are urgently seeking financial help to cover the costs of the food and care they need. We are looking for people who will either sponsor one of these precious animals for a year, or make a one-off donation,” he says. Our rescue center– one of only seven of such facilities in Indonesia – provides a vital link in the process of returning distressed wildlife to their natural habitat. We care for, rehabilitate and release native endangered wildlife, most of which are the victims of illegal trading and poaching. 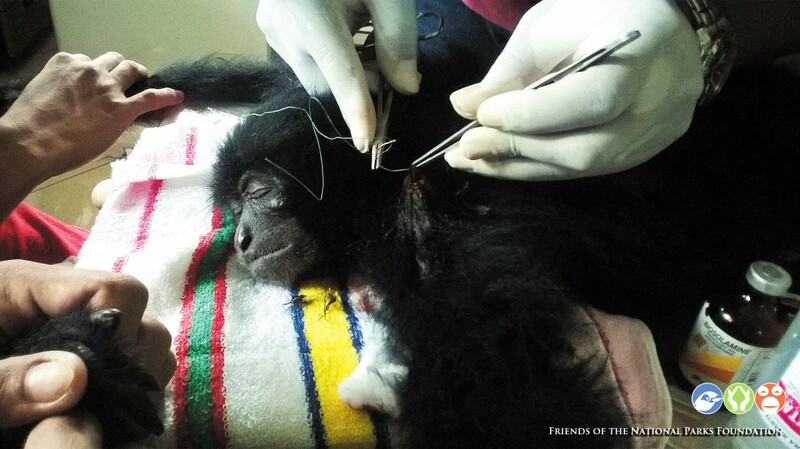 The seven gibbons –– were confiscated by the Department of Forestry’s Natural Resources Conservation Agency (BKSDA) in Bali on 17 January. The traders have been arrested by Wildlife Crime Unit. As a spokesperson of the Wildlife Crimes Unit, congratulated the BKSDA on saving the animals, catching the traders and hope that BKSDA and police are successful in unravelling the international networks and syndicates in southeast Asia, Middle east, and Europe countries. Ms Lehtinen says these highly threatened animals are listed as endangered on the IUCN Red List and wild populations are rapidly declining due to both habitat loss and poaching. They are victims of the illegal wildlife trade, which is a multi-billion business and unfortunately rampant in Indonesia. All gibbon species are protected by national and international laws but the risk of getting prosecuted is low. Animals are brought to the markets in Bali from Kalimantan and Sumatra. Often the more rare animals are not visibly on sale, and the trade happens behind closed doors. To take a baby gibbon from its parents poachers usually have to shoot the mother, says Ms Lehtinen. Sometimes the father and older siblings are able to escape. As with other primates, gibbons have a long intra-birth interval and so poaching has a devastating effect on wild populations. FNPF thanks the Humane Society International (Australia) for funding the rescue center’s operation costs since we took over operations in 2011. For more information on our work visit www.fnpf.org. For more information or to arrange an interview please contact FNPF’s Communication Manager Kirana Agustina on (+62361) 977978 or at info@fnpf.org.